Whether you call it flan, crème caramel, or crème renversée, it’s hard to resist a creamy custard turned upside down and served in a pool of liquid caramel. The flavors of crème caramel are always more complex than regular custard because of the caramel that surrounds it during baking and chilling, which adds a layer of flavor beyond the custard itself. A measure of white chocolate gives this one a lovely texture, while the lime and caramel work in tandem to cut the sweetness of the chocolate. Though this is a classic crème caramel, with whole milk and eggs only, the white chocolate makes it taste richer and creamier. 1 Make and flavor the custard: Heat the milk, sugar, and lime zest in the medium saucepan over low heat just until the mixture begins to simmer. Remove from the heat, cover, and allow to steep for 1 to 1½ hours, until the lime flavor is strong. You can even leave the mixture to steep overnight in the refrigerator, if you like. 2 Make the caramel lining: Pour the water into the small saucepan and add the sugar and cream of tartar. Cook over medium heat, stirring constantly, until the sugar has dissolved and the liquid is clear. Increase the heat to high and boil rapidly, swirling the pan occasionally (without stirring) to cook the sugar evenly, until the caramel turns a deep golden brown (for more on caramelizing sugar, see page 26). Remove from the heat and immediately divide the caramel among the custard cups, swirling each cup to distribute the still-liquid caramel evenly up the sides. Be careful to go only about halfway up the sides. The caramel is very hot and you don’t want it to drip off the edge of a cup and onto your skin. You may want to keep a small bowl of ice water nearby in case a bit of caramel touches your skin. Set the caramel-lined cups in the roasting pan, making sure they don’t touch, and let them cool for 10 minutes. 3 Preheat the oven to 325°F and position an oven rack in the center. 4 Temper the eggs: Place the saucepan with the lime-infused milk mixture back over medium heat, uncover, and reheat just until it begins to simmer. Whisk the eggs in the medium bowl. Twist a damp kitchen towel into a rope and wrap it around the bottom of the bowl to secure it while you temper the eggs. Pour about ½ cup of the hot milk mixture into the eggs, whisking constantly. Once blended, whisk in another ½ cup. Then slowly pour the rest of the mixture into the eggs, whisking constantly. Add the white chocolate and whisk until melted and blended completely. 5 Strain and bake the custard: Pour the mixture through the strainer into the pitcher and discard the zest. Divide the warm custard among the cups in the pan. Pull out the oven rack and place the pan on the rack. Remove one of the cups, pour enough hot tap water (not boiling) into that area to come halfway up the sides of the cups, and replace the cup. Cut a piece of foil large enough to fit just inside the edges of the roasting pan, then lay the foil across the top of the cups, making sure it doesn’t touch the custard. You may need to smooth and flatten the foil on the counter if any wrinkles touch the custard. Gently push the rack back into the oven, shut the oven door, and bake the custards for 30 to 40 minutes, until they are just set and their centers are no longer wobbly (test by gently tapping the side of the pan with a spoon). 6 Remove the foil and then the pan from the oven, being careful not to tilt the pan and splash water on top of the custards. Set the pan on a heatproof surface. Use a pair of tongs (or your hand protected by a kitchen towel) to immediately remove the cups from the water bath and place them on a rack to cool to room temperature, about 40 minutes. Cover with plastic wrap and refrigerate until cold, at least 4 hours or overnight. 7 Unmold the custards: Run a mini-spatula or a thin, flexible knife inside the edge of a cup, pressing the knife into the cup to avoid gouging the custard. Place a serving plate upside down on top of the cup, then, holding the two together, invert them. The custard should slide out of the cup and onto the plate. Candied lime zest is a lovely garnish here. Place a few strands on top of each custard and scatter a few more around each plate. 8 Serve the custards: Crème caramel is at its best at room temperature, so let the custards, still in their cups, sit out for about 30 minutes before serving. If you like, place a small spoonful of softly whipped cream on top of each. Candied lime zest is a lovely garnish here. Place a few strands on top of each custard and scatter a few more around each plate. To make candied citrus zest: Zest 4 limes, lemons, oranges, tangerines, or grapefruits using a vegetable peeler. Scrape off any white pith with the tip of a knife and cut the zest into long thin strips. In a small saucepan, bring 1 cup of water and 1 cup of sugar to a boil. Stir briefly until the sugar has dissolved and the liquid is clear. Add 2 tablespoons of light corn syrup and the zest. Reduce the liquid to a simmer, cover, and cook for 20 to 30 minutes, or until the zest is translucent and tender. Use immediately or refrigerate the candied zest in the syrup in an airtight container for up to 1 month. White Chocolate–Lemon Crème Caramel Substitute the zest of 2 lemons for the lime zest. 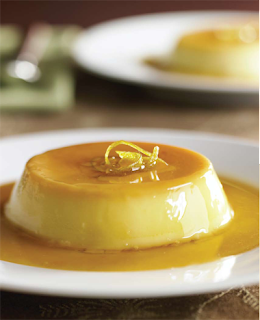 White Chocolate–Orange Crème Caramel Substitute the zest of 1 large orange for the lime zest. The caramel-lined cups can be prepared a day in advance and kept at room temperature, covered with plastic wrap. The custards can be baked up to 2 days in advance and chilled, covered with plastic wrap. Unmold shortly before serving.